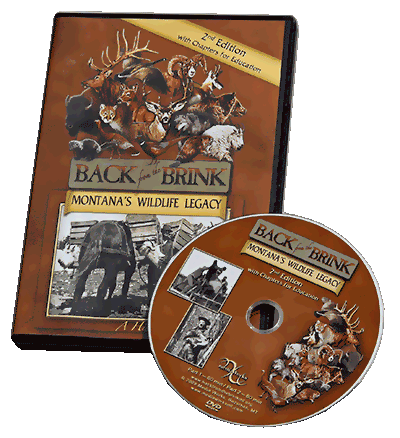 The Montana’s Wildlife Legacy “Decimation to Restoration” book, and “Back From the Brink” DVD are now available for purchase online through Amazon.com. 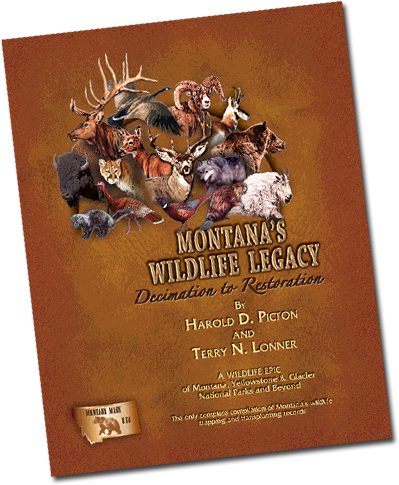 The only complete compilation of Montana’s wildlife trapping & transplanting records. 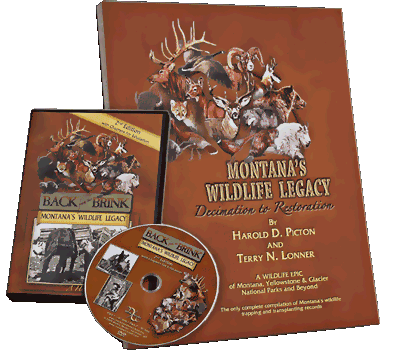 The only complete compilation of Montana’s wildlife trapping and transplanting records. As we enter the 21st century Montana is blessed with exceptional wildlife resources. Such abundance is not due to chance or accident. Herein is the story about Montana’s Wildlife Legacy. The stories, documentation, and photographs from the epic adventure and triumph provide a classic journey. This is a two-part documentary about exploitation and depletion, need and greed and ultimately a story of restoration, renewal and rebirth of Montana’s rich wildlife resource. Both parts include many historical photos, films, illustrations, paintings and interviews of old timers, citizens, sportsmen, historians, and wildlife experts. Part One chronicles the depletion of Montana’s wildlife during the 1800s and also features the beginning of Montana’s conservation movement during the first half of the 20th Century. This included the establishment of game farms for planting birds, the advent of scientific wildlife management and the landmark federal Pittman-Robertson (P-R) Act. Part Two documents how Montana citizens, state and federal agencies and universities worked together to take action in restoring the state’s once abundant big game and furbearer populations. It concludes with discussions of how citizens must work together to be ever vigilant to threats against wildlife and its habitat, so never again will Montana’s wildlife have to be brought “Back from the Brink”. Produced by Terry N. Lonner, Media Works Video, © 2005 – 2014 Media Works, Bozeman, MT – All Rights Reserved, Narrated by Joseph Campanella. Save 20% by purchasing the “Decimation to Restoration” Book and “Back From the Brink” DVD in a set. Each delivers a unique historical perspective that compliments the other, making the two excellent companions for history buffs & educators alike.